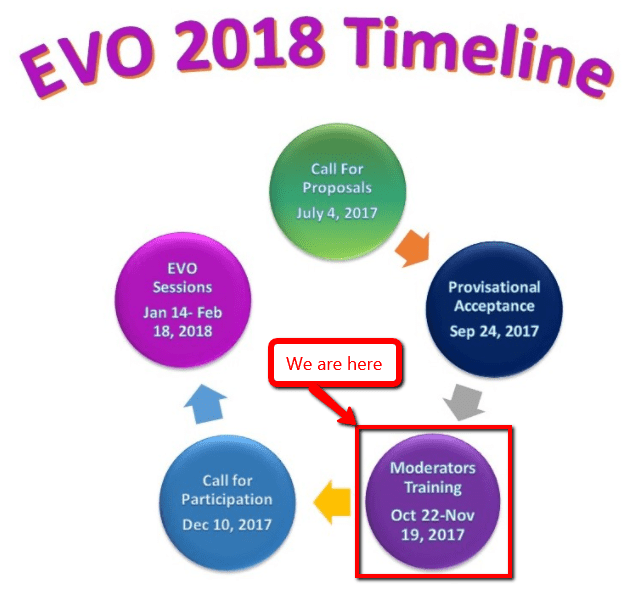 On Sunday, Oct 29, at 1400 UTC, Learning2gether hosted the 1st live event in this year’s EVO2018 Moderator Training series. This is where the moderators whose proposals were accepted receive any help needed over 4 weeks time to bring them up to prime time readiness. The event was held in Bb Collaborate (BbC) and streamed on YouTube/live. In this way, anyone not able to enter BbC would be able to watch and listen to the stream, and interact with us in either the YouTube or Chatwing text chat spaces. The idea was to model for moderators one way they might conduct their own live sessions. We set up a stream for anyone to watch and listen. You’ve done your tech check and all’s OK ? We are thrilled to have the always energetic, passionate educational leader, Dr. Sarah Thomas, joining us today to share her vision for connected educators which inspired the creation of EduMatch. Sarah is a model for all of us as someone who is constantly thinking “outside the box” through her inspiration, reflections, challenging questions, cheerleading of the work of other educators and hard work as she spreads her message about the importance of being a connected educator. 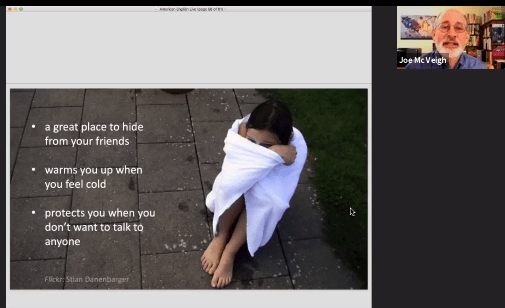 Webinar Description: With seven billion people in the world, we each represent a tiny dot…but what a beautiful picture we make when we begin to connect! Sarah Thomas, founder of EduMatch, outlines the story behind the magical moment when the project emerged sporadically from a conversation with a fellow educator. Follow the evolution of this series of grassroots connections (and related projects), which has spread internationally. By the end of the session, educators will be encouraged to seize their own “magical moments,” and to fuel these through the power of connectivity. On the Classroom 2.0 LIVE! site (http://live.classroom20.com) you’ll find the recordings and Livebinder from our recent ”Becoming a Better Teacher” session with Rushton Hurley. Click on the Archives and Resources tab. Learning2gether is a non-funded, free podcast put on informally by teachers forming a community of practice supporting online facilitation of topics regarding innovations in language learning and educational technology, and on education in general. where this session modeled techniques in using free online facilitation tools to make online events as accessible as possible, while creating archives of audio, video, and text recordings. This is a credentialed space. You can create an account there or log in with Facebook, Google, Twitter, or Tumblr. or even anyone who is in the HoA; let’s all focus on one chat space, this one! We use Chatwing for all our text chat in order to have a universally inclusive conversation, not possible with Google / YouTube or HoA text chat. HoA text chat can be seen only by those actually in the HoA. Google chat is visible only to those logged onto Google. Busy moderators can only focus on Chatwing – it is difficult to present and monitor numerous chat spaces at once . Once the event had started, we posted the direct link to the HoA in the Chatwing text chat. Anyone wishing to join us in the HoA was able to do so by clicking on the link, up to 10 participants in the HoA at any one time. 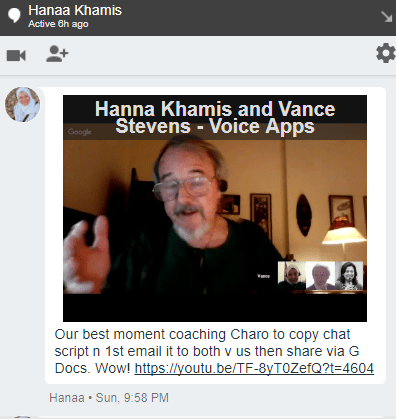 Three participants, Charo Lanao, Ayat Tawel, and Chris Fry, joined us in this way, and David Winet left word in the text chat that he was listening in and getting some ideas he might like to try in class. So, that’s the rough agenda in a nutshell. Please try to make room on your calendar for the slots outlined. One thing to note is that the three daily slots – morning, evening and night Pacific Time – have been picked to maximize collaboration across continents (Americas, Europe and Australasia). The more participants stay within these boundaries, the more likely it’ll be they’ll attract session attendees from around the world. That said, if you have assembled a group of people around a hot topic and everyone is fired up and ready to go, feel free to pick a time, any time, that works best for your group. Just try to stick within the 48-hour period from Thursday afternoon to Saturday afternoon Pacific Time. More details to be announced as they become available. Questions? Leave a comment below, find us on Twitter or shoot us an email. Thanks! 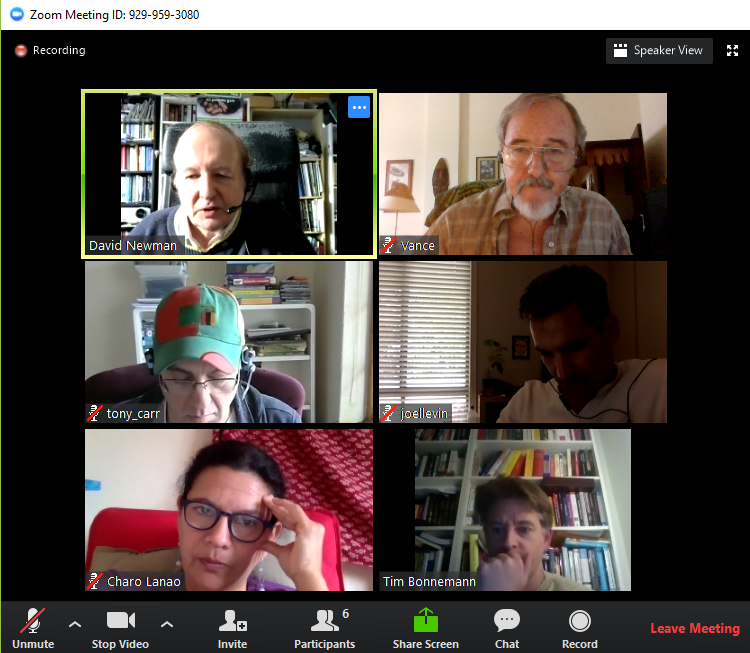 Your favorite online unconference on the art and practice of facilitating in virtual environments is back! Join us October 16-22, 2017, alongside International Facilitation Week. 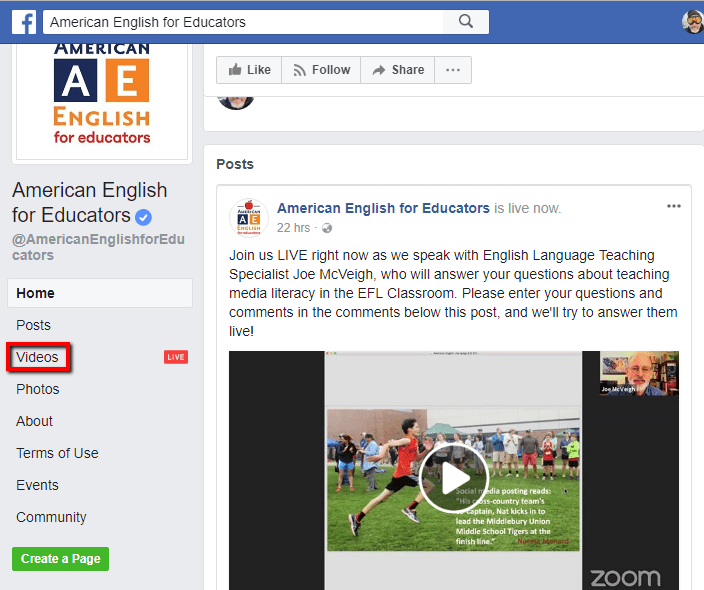 Share, learn, connect, and have fun with participants from (or currently based in): the United Kingdom, Ireland, Germany, Spain, Finland, Iceland, Australia, Peru, Canada, and the United States. Want to know more? Check our FAQ. 2. Tell us your expectations! We’d like you to bring along your facilitator friends and colleagues to the event. Tell them to use coupon code peer2peer, and they’ll be able to get in for just $17. This offer is good through Monday, October 16th at 12pm noon Pacific Time (extended from today). Our goal is to make the Online Facilitation Unconference as accessible and inclusive as possible. We are making a limited number of pick-your-own-price and even FREE tickets available – no questions asked! Great for students, retirees, people from developing countries etc. Please share this opportunity with your networks and help us make sure we don’t have any of these left over by the time the conference starts. Thank you! There is a fee structure that increases fees from $29 to $39 on Oct 5, and to $59 on Oct 12 (assuming you use the cyberspace link). But the organizers’ goal is to make this event as accessible and inclusive as possible. Highly discounted and/or free tickets for students, low-income people and attendees from developing countries will become available – no questions asked – as regular registrations pick up. Orientation sessions – don’t miss! Quick introduction to the process: how does an unconference even work (and how to get the most out of it)? We’ll probably add one or two more of these (the extact times are yet to be confirmed). The idea is to give every attendee of the Online Facilitation Unconference at least a couple of opportunities to join an orientation, no matter where they are based (whether in Europe/Africa, Asia/Australasia or the Americas). Introductions and session brainstorming continues. 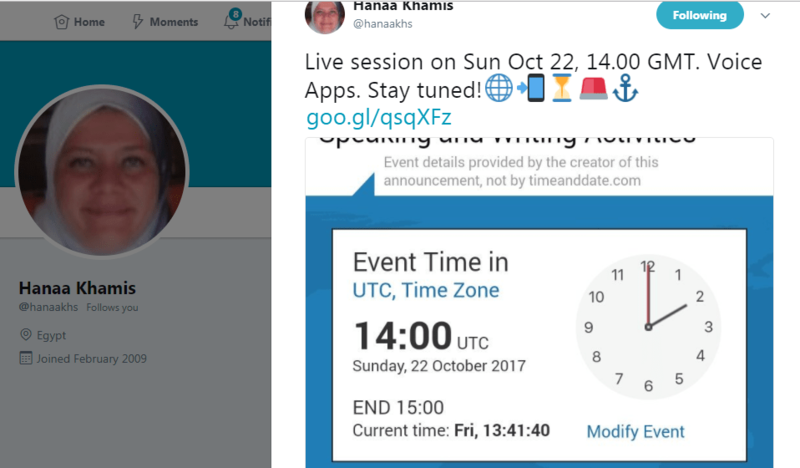 This is an asynchronous activity so everyone can join in whenever they have time available. Over the course of the day, we will host one or two live orientation sessions. Yet more introductions and session brainstorming. At this point, we should start to see a good number of sessions being added to the unconference schedule. Over the course of the day, we will host another one or two live orientation sessions. At this point, mostly everyone should have had a chance to attend one of these. Of course, the OFU team will be available to answer any additional questions, either via email or in the online venue we will provide. We may have a few pre-scheduled sessions on offer for either Wednesday or Thursday, details are still being confirmed. Need to download and install the Zoom app, so give yourself a little extra time if necessary. We may add one or two more of these (the extact times are yet to be confirmed). The idea is to give every attendee of the Online Facilitation Unconference at least a couple of opportunities to join an orientation, no matter where they are based (whether in Europe/Africa, Asia/Australasia or the Americas). We’ve set up an attendee-only online space to meet, greet and brainstorm session topics. Everyone should have received their invite yesterday afternoon/evening. Check your spam folder if you can’t immediately find it. Don’t hesitate to contact us at hello@ofuexchange.net in case you run into any problems. Still a few free and “pay what you want” tickets available. Excellent opportunity for students, retirees, or anyone else currently on a low income to still attend the event and share, learn & connect. Please share with your networks. We want all of these to be gone by the time sessions start on Thursday, at the very latest. Thank you! Absolutely last chance to register for the event (last-minute rate ends at 12pm noon Pacific Time). We will make sure all sessions get documented and reported so those who could not attend can still find out about what happened. Unconference sessions will take place during three time slots, calibrated to catch people awake in three land masses throughout the globe. Of course, the schedule is never really closed. Sessions may bring up ideas for more sessions. The discussion in our online venue will continue. 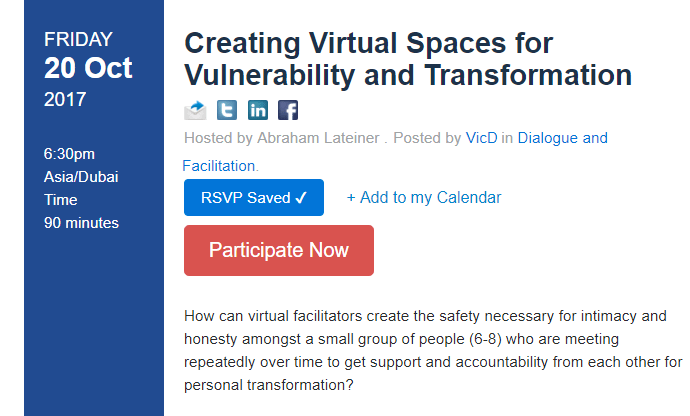 Description: How can virtual facilitators create a sense of intimacy and honesty around tough topics amongst a small group of people (6-8) who are meeting repeatedly over time? Using technology it is possible to offer pre designed processes to facilitators and coaches to help them deal with virtually any issue. The question then becomes how to use the technology to support effective coaching and facilitation without losing the impact and power of direct relationships. We will explore this issue and brainstorm some ideas for getting the balance right. There will be some software demonstrations and participants are encouraged to bring their favourite tool to discuss with the group. Massachusetts, like most states, has an Open Meeting Law. (Some states call it a Sunshine Law.) Basically, it says that public business must be conducted in the public’s view – that is, it must be open to public visibility. A quorum of a Public Body (a Board, Committee, or Commission, etc.) is not allowed to deliberate on a matter within their jurisdiction except at a duly announced in-person meeting. They are not allowed to conduct such deliberations in private meetings, by phone, or by E-Mail (for fear that they would make some kind of secret deal of which the public would be unaware). I want to amend the Massachusetts Open Meeting Law to permit members of public bodies to participate in Public Internet Discussions, provided that there is a public announcement of the Public Internet Discussion including instructions for free Internet access to monitor the discussion as fully as the members of the public body themselves, every statement is date and timestamped and attributed to the person who made it, an archive or transcript is kept and instructions for free Internet access to the archive is included in the announcement of the Public Internet Discussion. I envision Public Internet Discussions being asynchronous, written text-based discussions that are in operation 24 hours a day, seven days a week, for an indefinitely long period – perhaps years or even decades. In this session we can discuss issues related to this. There are technical issues having to do with authentication, correct attribution, prevention of forgery, etc. There are legal issues having to do with moderation when there is a requirement to have a public record. There are political issues having to do with objections and resistance on the part of legislators who would have to change the law and on the part of special interests who feel that prohibiting Public Internet Discussions is more to their advantage than permitting them. 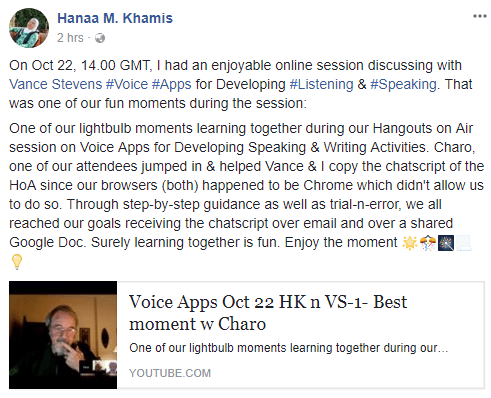 The session is on Friday, 20-Oct-2017 at 10 AM Pacific, 1 PM Eastern, 1700 UTC using Zoom. We will explore the pros and cons of virtual facilitation in synchronous (real-time) and asynchronous (non real-time) modes, experiencing how online tools can support both modes and your facilitation goals. This will be a hands on session; after a 10’ presentation of the concept we will simulate a hybrid creative problem solving (CPS) session that mixes synchronous and asynchronous phases. How to participate to the simulation (Stormz) ? Description: In this session, you will be presented with a rich New Zealand case study of a public deliberation process for approximately 30 minutes. This will be a starting point for group discussion following the interests of those who attend. The deliberation topic was the pre-birth testing of human embryos and foetuses. The case study speaks to a number of issues that have been raised so far in various discussions including the respectful discussion of sensitive topics (this one backs onto abortion) in small online groups, scaleability, vulnerability and transformation, hybrid face-to-face and online processes (the main focus will be on the online process), institutional arrangements and more. Record of session: I have some PowerPoint slides and will make a video recording (someone please remind me!). Are there any volunteer note takers willing to record the discussion? There will also be some kind of closing activities, details to be confirmed. Imagine scores or hundreds of people discussing possible solutions to a big issue. People set up local meetings of half a dozen people in their homes or a community room (just like supporters did in the campaign of Larry Sanders’ brother). They are connected by video conferencing to lots of other similar groups and the event organisers. After an introduction they discuss in their own rooms, while someone takes notes that are shared to a group who pick out common themes and ideas to be fed back to all the rooms. Over the event they reach consensus on some ways forward. That is modelled on the techniques AmericaSpeaks used to do in 21st Century Town Meetings in one big room. But now video conferencing is more reliable, we could try distributed meetings. The session will collect ideas on how to make this vision work – technically, psychologically, organisationally and financially. The output will be a list of ideas and steps we could take to create a trial of the technique. NOTE: This session will follow Lucas Cioffi’s “QiQoChat Cafe”, but allow for a 30-.minute break. You do NOT need to download the Join.Me app (unless you want to). You can simply just use your web-browser. World-wide phone-in numbers are available (look for “Microphone” icon), but the default call-in is +1-202-660-1314 (Washington, DC) which allows you to remain anonymous if you choose. Instead of using computer speakers, I suggest you use a headset (or ear-buds) to avoid audio-feedback. This session will allow everyone an opportunity to give their “elevator speech” (1-minute max.) or otherwise share their thoughts about the OFU Exchange 2017 sessions, specifically, or the general state of Online Facilitation and where you think it needs to go. 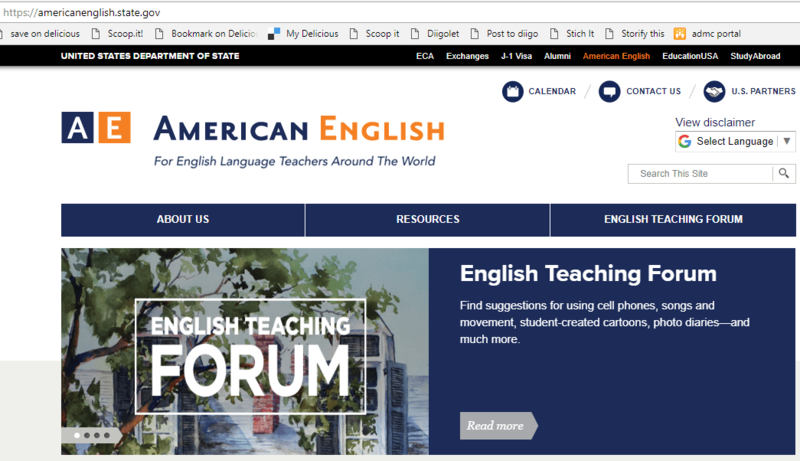 I am particularly interested in hearing ideas about how we can create a “Community of Practice” for Online Facilitation, with the goal of Improving Online Discussions. The group would mostly exist online, of course, but also at face-to-face meetings. I thank Tim for setting this whole thing up, but I think that we have been too scattered to take proper advantage of our collective wisdom and, so, need to talk about how to set up a “home-base” (even a temporary one) for our community-to-be. This week’s webinar is a very special show for us! We have the opportunity to learn all about Picture Book Month from Tara Lazar and Katie Davis, co-founders and renowned children’s authors. Picture Book Month was envisioned and founded by Dianne de Las Casas who was our special guest presenter in May, 2017 on Classroom 2.0 LIVE. Sadly, Dianne lost her life in a tragic fire recently and we wanted to honor her legacy by celebrating her life through this featured presentation about Picture Book Month. We will learn about the importance of picture books for students and Picture Book Month. They have created an outstanding Teacher’s Guide for participants in Picture Book Month. Our presenters will also share some of their special memories of Dianne de Las Casas including a special visit from John Couret who began writing children’s books because of Dianne’s inspiration. Tara Lazar has six picture books in print with many more to come. Her latest title is “7 Ate 9: The Untold Story” from Disney*Hyperion. Next fall look for her illustrated dictionary “500 Words to Bumfuzzle Your Teachers & Bamboozle Your Frenemies”. Tara is the founder of STORYSTORM, a writer’s brainstorming challenge formerly known as Picture Book Idea Month. She is a picture book mentor for We Need Diverse Books and the co-chair of the Rutgers University Council on Children’s Literature annual conference. Katie’s secret superpower is her ability to teach non-techy and tech-fearful writers how to become better business people by building their platforms through social media, video, and creating/building mailing lists. Also known in her niche as one of the first writer entrepreneurs, Katie has created many events and courses for writers, including How to Create Your Author Platform (and Market Your Books without Being Pushy), Video Idiot Boot Camp, and Picture Book Summit (the largest and first online conference of its kind). Her podcast, Brain Burps About Books, is consistently ranked in the top 10 book-related categories. She’s appeared regularly on WTNH and The Huffington Post. She is the director of the Institute of Children’s Literature, which provides accredited writing courses for both adult and children’s books. Katie has been honored to speak everywhere from a maximum security prison, to elementary schools, to university level, including UCONN and Yale, and has keynoted conferences and fundraising galas. On the Classroom 2.0 LIVE! 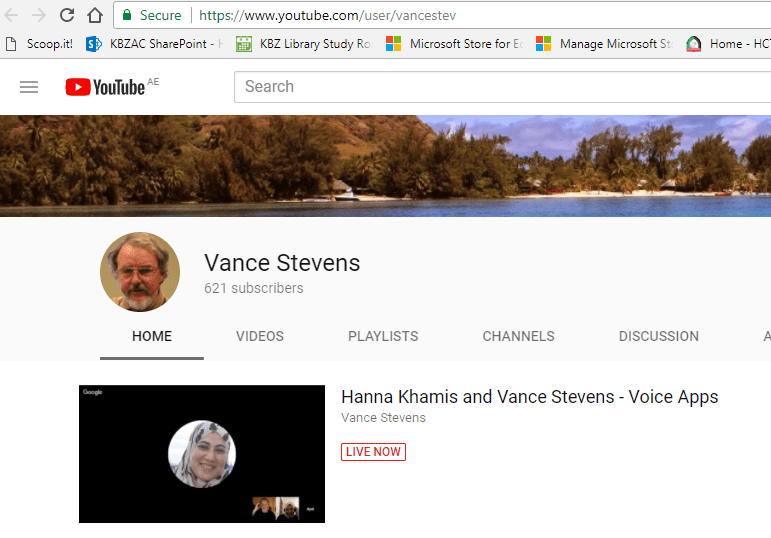 site (http://live.classroom20.com) you’ll find the recordings and Livebinder from our recent ”Featured Teacher: Michael Foster” session with Michael Foster. Click on the Archives and Resources tab. We are so excited to have Rushton Hurley joining us to share some of his awesome, practical tips for lots of small things that can make a huge difference in providing the best possible instruction to support learners in your classroom while keeping your sanity as a teacher. Rushton’s positive, comfortable style spiced with humor and great stories always leaves us feeling motivated and inspired to give our very best every day! Every last one of us can improve. How we try to capture attention and inspire our students intellectually can take many forms, and I would contend that any effort to improve this without a focus on what can be cool and fun lessens one’s chances of success. In this Classroom 2.0 Live session, we’ll look at easy ways of getting better at getting higher quality from our kiddos. 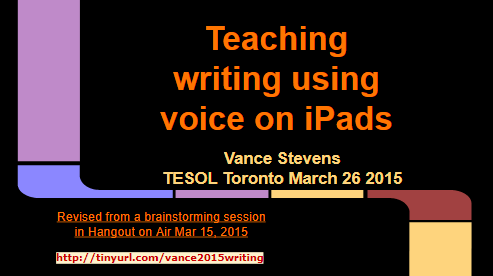 Join in for some cool, fun, and practical ideas! Rushton Hurley (@rushtonh) has worked and studied on three continents as a high school Japanese language teacher, principal of an online high school, a teacher trainer, and a speaker. 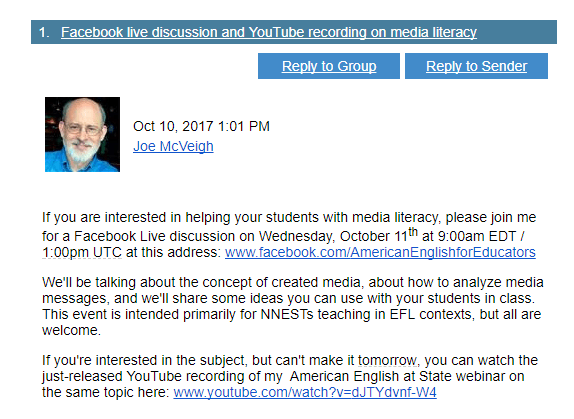 He founded and is executive director of the educational nonprofit Next Vista for Learning, which houses a free library of videos by and for teachers and students at NextVista.org. He is heavily involved in service efforts in his community and holds masters degrees in Education and East Asian Studies from Stanford University. Rushton regularly keynotes at conferences and has trained and worked with teachers and school leaders around the world His fun and thoughtful talks center on inspiration and creativity; the connection between engaging learning and useful, affordable technology; the power of digital media; and the professional perspectives and experiences of teachers at all levels. 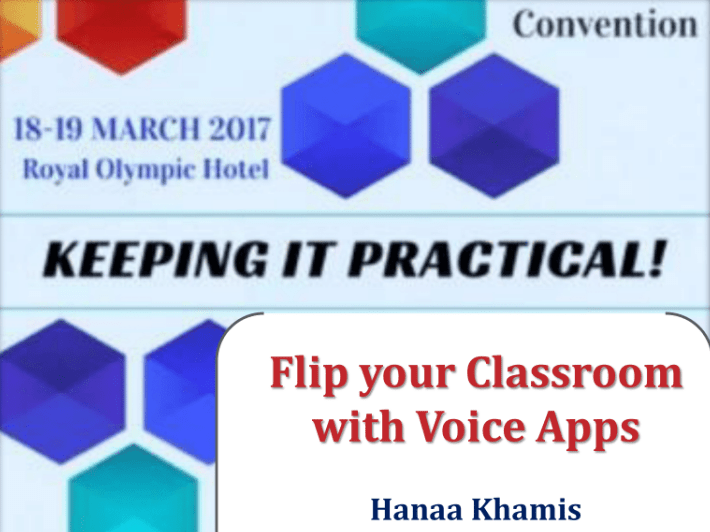 His first book, Making Your School Something Special, was released by EdTechTeam Press in January of 2017. His second book, Making Your Teaching Something Special, was released in June, 2017. On the Classroom 2.0 LIVE! site (http://live.classroom20.com) you’ll find the recordings and Livebinder from our recent ”Picture Book Month” session with Tara Lazar, Katie Davis, John Couret and Paula Naugle. Click on the Archives and Resources tab.